For the last week, I have sat in a comfortable room in Geneva, along the lake with a picturesque view of the Alps. Joining 500 other representatives of governments, industry, international organizations and civil society, I had come for the Second Conference of States-Parties to the Arms Trade Treaty (ATT), the global treaty adopted in 2013 to regulate the international trade in conventional arms. But while we sat in the room discussing how many working groups to establish, people around the world were suffering and dying from the very weapons the ATT is intended to regulate. Instead of talking about irresponsible arms transfers, or potential violations that undermine the legitimacy of the treaty, the week focused on bureaucratic process and functions. Governments decided to establish three working groups—on treaty universalization, treaty implementation, and transparency and reporting. They created a voluntary trust fund to provide assistance to governments needing help with treaty implementation with a 13-member selection committee. Lastly, they appointed a permanent head of the secretariat for the treaty. All of this could of have been done before the conference even started, which would have left ample time to discuss the actual implementation of the ATT. While establishing bureaucratic processes are essential for the long-term operation of the treaty, the lack of substance was both disheartening and disappointing. Civil society representatives took to the floor several times to raise issues related to the human cost of conflicts waged by conventional arms. Yet the only government to speak about the urgency of discussing arms transfers and potential treaty violations was Zambia, which gave an impassioned plea that went unacknowledged. The Control Arms coalition—an international group of civil society organizations—spent the week jumping through bureaucratic hoops in order to offer its paper on the arming of Saudi Arabia for use in Yemen, after being rebuffed for its suggestion to include an agenda item on the application of the ATT. The Third Conference of States-Parties will be in Geneva in September 2017, under the leadership of Finland, which has stated several times that it would like to see a focus on substantive aspects of treaty implementation. That work should start immediately. 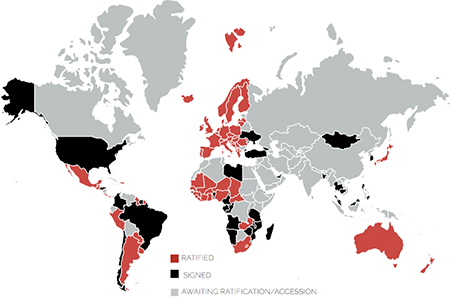 Since the operations of the treaty are now complete, states-parties have no further excuses not to focus on what the treaty was intended to do—regulate the trade in conventional arms in order to reduce human suffering and save lives. Rachel Stohl is a board member of the Arms Control Association and senior associate with the Stimson Center. Her areas of expertise focus on issues relating to the international arms trade, including drones, small arms and light weapons, as well as children and armed conflict.